I’m sure many of you out there are scrambling to put together you club plans. Well, this post should help save you some time! It is never a good idea to “wing” the music plan. I’ve led songs for a long, long time. I’ve led music while singing and playing guitar at lots of summer camps and too many weekend camps to count. This isn’t to boast, but I can safely say that if I needed to “wing” it (at camp or in my local club), I could. But I don’t. And you shouldn’t either. And wow, it is a great feeling to just plan it out and know that it is done. It allows you to focus on the main thing during the week and at club… the relationships (and leading people to Jesus)! My friend Eric from Sarasota does the same thing and was nice enough to pass along his plans. So below I have three things I want to pass along to you. First, Eric’s plan (an image and pdf). Second, my plan (and image and Word doc). 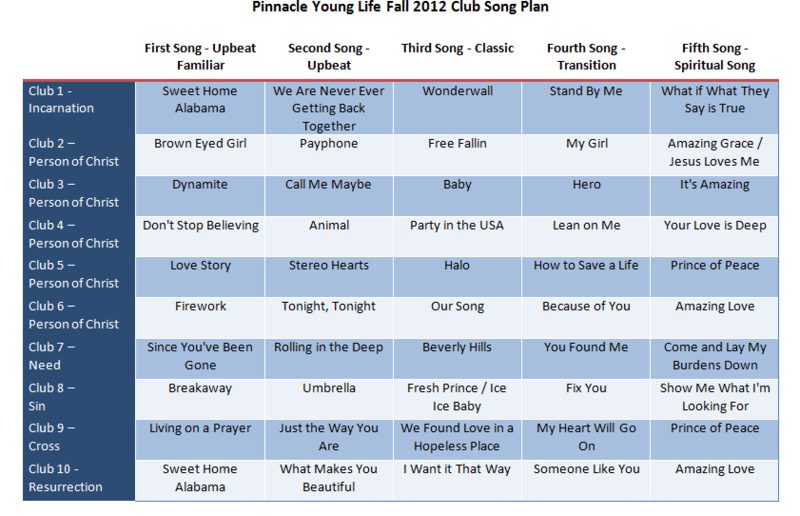 And, third, a Spotify link to the songs I’m going to play this Fall in club so you can give them a listen. Hope this helps! 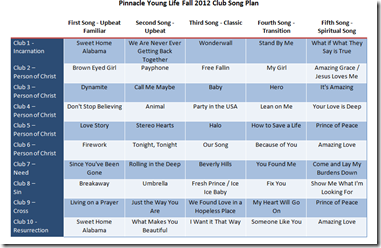 PS… Here is a bit more too… Drew put together a great post here about a club playlist. And big thanks to Chris for putting the list in a Spotify playlist here. PPS…Always be sure to follow the appropriate guidelines for using music in club. See you local staff for details. Previous post Wyldlife Parents Info Magnet–Works Like Magic!